Unbeelievable Health | The history of BEE propolis and why it’s beneficial to human health! 08 Apr The history of BEE propolis and why it’s beneficial to human health! Bees produce some pretty spectacular things, including Bee propolis. Which throughout history has been known to be one of nature’s most unique & exciting substances for helping improve health, indeed it has over 2500 studies behind it on it’s use for human health, skin healing and more. We were so impressed the propolis’ pedigree that we made it the hero ingredient in our Bee Prepared immune formulas. Bee propolis comes from resins collected from trees and plants by bees. 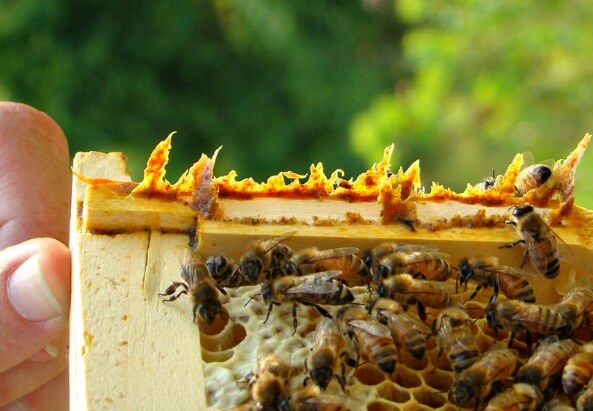 The honeybees use the sticky propolis to seal the hive and to create a sterile environment, free from microbes and other invaders. It is said that a bee hive is one of the most sanitary places on earth! Humans have been using bee propolis medicinally, both internally and externally, for centuries. Ancient Egyptians, Greeks and Romans used bee propolis for wound healing. From the 12th Century, bee propolis was used to aid in healing mouth ulcers and throat infections. In the first and second world war, propolis was used in first aid to reduce wound infection and to speed healing. Modern applications of bee propolis have expanded into skin care, dental care, digestive health, immune support, and more. Bee propolis is highly beneficial for human health. With research and clinical trials, the medicinal applications and actions of propolis are being discovered and better understood. Bee propolis is rich in nutrients and other constituents, such as flavonoids, which are responsible for its antibacterial, antiviral, anti-fungal and anti-inflammatory properties. One area of clinical focus is the beneficial immune supporting actions of bee propolis. Another reason it’s included in Bee Prepared immune formulas. Propolis supports the immune system by promoting the body’s natural defenses and resistance to bacterial, viral and fungal infections. It has been found to stimulate the production and action of macrophages, immune cells involved in the defense against microbial invaders in the development of antibodies. Bee propolis has been used throughout history as nature’s wellness formula. Propolis also disrupts the proliferation of bacteria cells by inhibiting cell division and by destroying their cell structure. These actions reduce the life and the spread of bacteria internally and externally. Laboratory studies have investigated propolis’ anti-inflammatory properties. Constituents in bee propolis prevent the production of prostaglandins, pro-inflammatory hormone-like substances which occur naturally in the body. By preventing prostaglandin production, bee propolis helps to reduce inflammation in the body. We are indebted to the bees for the magnificent products they provide for our enjoyment, health and survival. It is important to ensure their lives are sustained and protected. This fascinating video (click here) on bee medicines, primarily bee propolis, is by one of the most renown experts on propolis, James Fearnley. He boils the history, research and the magic of this amazing natural substance, down to an essence. Learn why it’s effective for immunity and human health in general. Buy Bee Prepared in health stores including Holland & Barrett & available globally via Revital. Click HERE. References for are available upon request. The primary source of references is Pub Med published research.